In essence, this is a calzone. 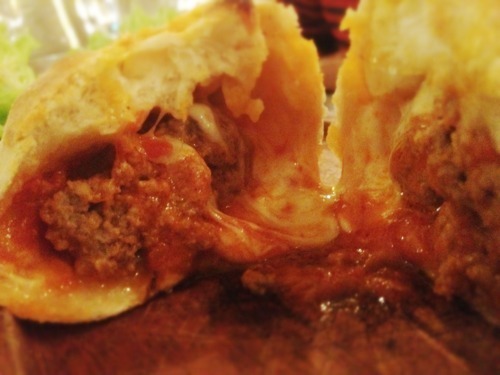 Albeit a tiny calzone with a big meaty center. And pickles. We do enjoy a bit of novelty from time to time. So bring on Fornata, a new Italian tapas slash small plates slash Soho backstreet bandwagon-jumper. Yes, those are floorboards stuck to the walls. The extensive menu suggests sharing a few dishes off the menu, three to four per head, but we came for their take on the burger, coincidentally the most expensive item on it at just under a tenner. 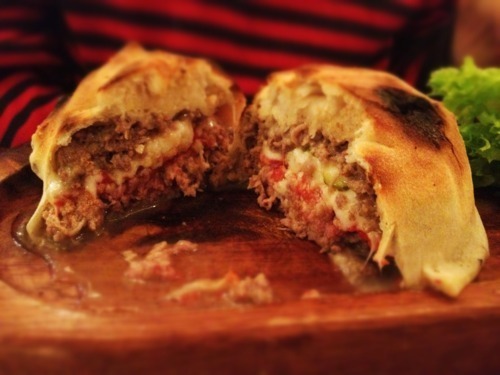 Predictably served on a wooden chopping board, with a few sprigs of lightly dressed lettuce, the burger arrived simultaneously with a baby meatball calzone, which we ordered as a comparison to the burger. Delicate baby Italian pizza pies, if you will. The sun-ripened tomato spread added both colour and a sweetness to it, but the pickles although present were largely undetectable (Rob picked one out, hot pickles taste weird). Novelty pickle, basically. The considerable amount of juice from the meat and cheese had metamorphosed the dough on the underside to the consistency of a huge gyoza. It was a nice contrast to the classic Italian pizza crust texture of the top. In essence, this is a calzone. 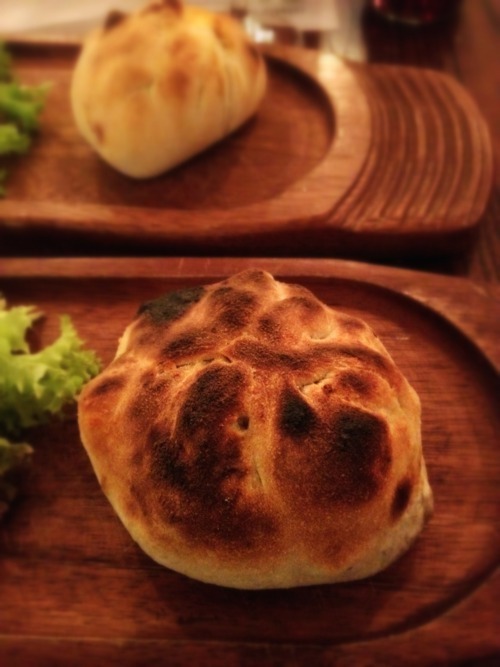 Albeit a tiny calzone with a big meaty center. And pickles. Although diminutive in stature (placing it on a tapas style menu allows Fornata to get away with this, kind of) and exorbitantly pricey as a result, it’s a nice, inoffensively mild pizza-with-a-hint-of-burger. So on to the proper meatball calzone, which was ever so slightly smaller (presumably because it had a meatball instead of a burger in it). It was far superior. The addition of a rich creamy tomato sauce gave it the extra kick. A much better dish. We might go back to Fornata. It’s totally unoffensive, really. A competent backup option for when those other nearby small plates Italian places are too full but not somewhere to seek out. But we are yearning for something a bit more substantial. Someone open a large plate Italian restaurant please. Italian food looks so doleful on such tiny plates for this price. Rob (I think it would be a good place for a date).